I’m pleased to announce that a 25th Anniversary Edition of Neither Wolf nor Dog, with a new foreword by my friend, Robert Plant, will be published in early September. If you’d like to pre-order a signed copy, contact wolfnordog.com. I love the new cover and am thrilled that it now opens with Robert’s heartfelt and poetic foreword. My favorite book, my favorite author and my favorite musician all rolled up in one awesome edition!!??? YES!!! thank you for this book, love it so much, have loaned to friends many times over so i feel a new copy is due! This book changed my life and the lives of many of my students. Thank you for your great work. 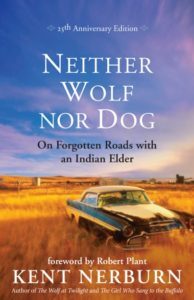 So excited for this new edition of “Neither Wolf Nor Dog.” 25 years! Amazing! Congratulations, my dear friend! I started reading this book a couple of days ago and am fully immersed! A friend loaned it to me in preparation for a trip I am taking with my church to Pineridge Indian reservation in South Dakota next month. Looking forward to finish reading this book and the two that come after it.